In my opinion, this was an amazing trip and an extremely great deal. 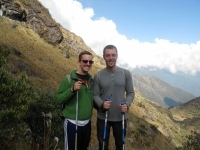 The guides were very personable, knowledgeable and encouraging -- in every possible way. I would definitely recommend this trip to friends and family of all ages -- and all interests, whatever they may be. Unbelievable experience. 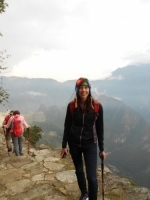 So good, it was my second time on the Inca Trail and visiting Machu Picchu. 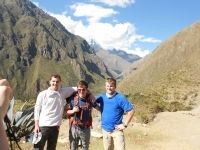 Gerson, our guide, knows so much about the Incas, each site, and Machu Picchu itself. Our porters were amazing, set up all our tents, gave us hot tea and clean water each morning, and fed us the most incredible food. 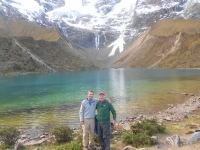 This trip with Inca Trail Reservations was incredible and exceeded my high expectations. Gerson, our trail guide, was insightful, helpful, and funny. 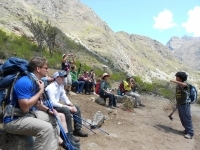 He taught us all quite a bit about the Inca people and nature on the trail. Overall, his dedication to his work showed and was appreciated. It was the trip of a lifetime! Everyone on the trip was so nice and helpful. The team was supportive and made the experience even more enjoyable. I will recommend this tour to anyone interested. 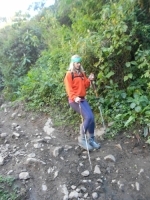 The four day hike to Machu Picchu exceeded my expectations and a traveler to the area would be doing themselves a disservice to visit the site without the hike. 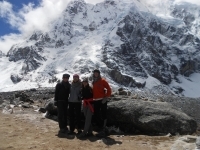 The company took great care of us: the food was amazing, the porters congenial and strong, and the guide knowledgeable and easy to get along with. It was an unbelievable trip that exceeded my expectations. I would definitely recommend this. 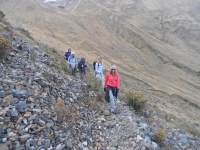 I took the Inca Trail on September 1st and had great weather for most of the trip. The meals were unbelievable and the sights were unforgettable. If you're looking for an adventure and to sharpen your buns into steel, this is the trip to take. This trip is not for the fainthearted or in mere physical shape. 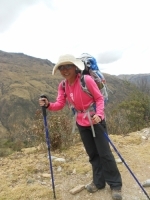 Anyone considering the Salkantay trek should be healthy, in decent shape and can tolerate days without bathing/showering. I had a blast on this trip! The hiking was fantastic and the sights were unbelievable. This experience has exceeded every expectation. From the very well organized itinerary to the amazing team of guides, porters and cooks, every single aspect of this tour and every person involved made it an exceptional experience that I'll never forget. 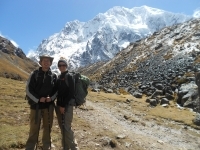 Our trip on the Salkantay trek far exceeded my expectations. The trek was challenging but so rewarding due to Lito, a passionate, funny and smart guide; our wonderful cooks Simone and Simon; and a great group of people who were driven to finish but also enjoy the great scenery along the trek. As I write this, my legs and feet barely move but I don't need any time for reflection to know that the experience has been well worth the physical demands. Truly a once-in-a-lifetime experience, and an amazing opportunity to shut off the world, challenge yourself physically (and mentally! ), and embrace new culture and history. It was absolutely amazing. If you are looking for a difficult trek, look elsewhere. They carry your stuff and do almost everything you could want them to do. I'm 20 and backpack so it was quite easy, but for my dad who is in great shape for a 60-year-old, the trip was difficult due to the high altitude.